Citation Information: J Clin Invest. 2005;115(12):3623-3633. https://doi.org/10.1172/JCI25947. In this study, we investigated whether elimination of CD4+/CD25+ Tregs using the recombinant IL-2 diphtheria toxin conjugate DAB389IL-2 (also known as denileukin diftitox and ONTAK) is capable of enhancing the immunostimulatory efficacy of tumor RNA-transfected DC vaccines. We show that DAB389IL-2 is capable of selectively eliminating CD25-expressing Tregs from the PBMCs of cancer patients without inducing toxicity on other cellular subsets with intermediate or low expression of CD25. DAB389IL-2–mediated Treg depletion resulted in enhanced stimulation of proliferative and cytotoxic T cell responses in vitro but only when DAB389IL-2 was omitted during T cell priming. DAB389IL-2 significantly reduced the number of Tregs present in the peripheral blood of metastatic renal cell carcinoma (RCC) patients and abrogated Treg-mediated immunosuppressive activity in vivo. Moreover, DAB389IL-2–mediated elimination of Tregs followed by vaccination with RNA-transfected DCs significantly improved the stimulation of tumor-specific T cell responses in RCC patients when compared with vaccination alone. Our findings may have implications in the design of immune-based strategies that may incorporate the Treg depletion strategy to achieve potent antitumor immunity with therapeutic impact. Characterization of CD4+ T cell subsets. (A) PBMCs from an RCC patient were stained with anti-CD4/CD25 mAbs and analyzed by FACS. (B) CD4+CD25neg, CD4+CD25int (R1), and CD4+CD25high (R2) T cells were sorted. For functional analysis, CD4+CD25neg (left panel) and CD4+CD25int (middle panel) T cells were stimulated with tetanus toxoid–loaded DCs (tetanus), DCs transfected with autologous RCC RNA (RCC), or with DCs transfected with autologous RE RNA (RE) at the indicated stimulator to responder ratios. After 48 hours, cells were pulsed with 3H-thymidine, and incorporation was determined using a liquid scintillation counter. CD4+CD25high cells (right panel) were functionally validated by MLR. Mixture ratios of 1 CD4+CD25high cell per T cell (Treg 1:1) or 1 CD4+CD25high cell per 5 T cells (Treg 1:5) were added to the reaction, and inhibition of cell proliferation was analyzed. As a negative control, proliferation of CD4+CD25high cells was determined in the presence of allogeneic DCs only (DC+Treg). Results are presented as means with SD calculated from triplicate wells. 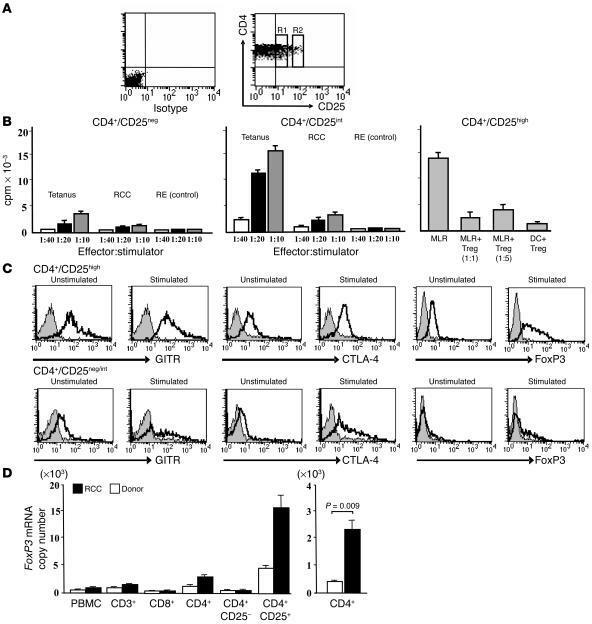 (C) FACS-based detection of GITR, CTLA-4, and FoxP3 by CD4+CD25neg/int and CD4+CD25high T cells subsets with or without stimulation using anti-CD3/CD28 mAb. Gray histograms represent isotypic controls. (D) Left panel: analysis of FoxP3 transcripts was performed by real-time PCR on indicated T cell populations. FoxP3 mRNA copy numbers were normalized to 1 × 107 copies of β-actin mRNA. A representative result from 3 subjects is shown. Right panel: FoxP3 mRNA was amplified from CD4+ T cells isolated from RCC patients (n = 5) and healthy donors (n = 5). Differences in FoxP3 mRNA expression among groups were significant (P = 0.009).